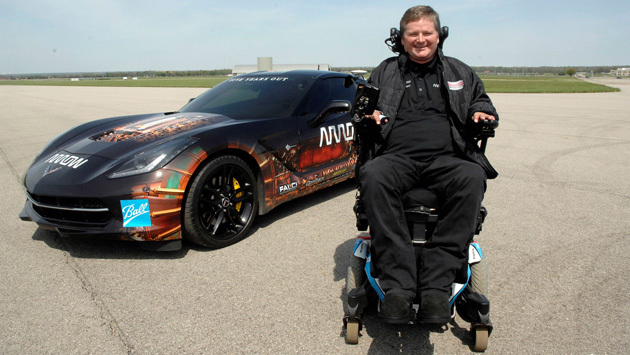 When Indy Racing League driver Sam Schmidt crashed in 2000 and became a quadriplegic, many assumed that his driving days were over. However, technology is about to put him back on the track. Arrow Electronics has developed the Semi-Autonomous Motorcar (SAM) project, a modified 2014 Corvette Stingray that will let Schmidt drive using only head tilts. An array of infrared sensors will translate his head movements into steering commands, letting him race around with ease; the only control he’ll touch is a pressure sensor in his mouth for braking. GPS will also keep Schmidt out of harm’s way by creating virtual fences around the track walls that nudge the car back on course. SAM isn’t ushering in a new era of hands-free racing, at least not yet. Schmidt won’t be competing against other vehicles, and he’ll have both a co-pilot and a pit crew that can take over in an emergency. You will get to see the technology in action very shortly, though: Schmidt will drive four laps with the Stingray at the Indy 500 on May 25th. It’s also just one piece of a larger plan. Arrow eventually hopes to roll its equipment into both regular cars as well as industrial and military vehicles, so it might not be long before many with limited use of their body can get on the road.